Sometimes the simplest of jobs requires a specialist tool. 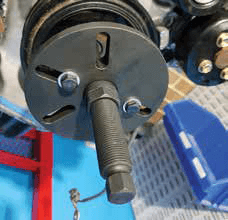 For example, when it comes to harmonic balancer removal and installation every manufacturer has their own take on how to this should be done, so when it comes to harmonic balancer kits, I’ve always been a bit cautious as not all kits suit all balancers and you can be sure you’ll be caught out every time. However, the HBTK001 harmonic balancer removal and installation kit might just change all that. The HBTK001 is a comprehensive kit when it comes to harmonic balancer removal and installation, and I do mean comprehensive. The kit contains a wide variety of both Metric and A/F bolts of varying lengths and diameters to suit just about any balancer that has bolt holes as well as thread adapters that screw into the crankshaft for installation. 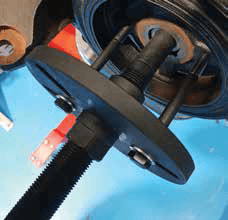 The included flange puller and plate are quite sturdy and during testing proved themselves against even the most stubborn of harmonic balancers. A bonus with this kit is that it comes with instructions that make sense, so the tool can be used correctly avoiding damage to both the tool and possibly the harmonic balancer and preventing the frustration that comes with ‘what does this part do’? If the instructions are ever lost or covered in greasy handprints you can always download them from the Dayco website. The HBTK001 Harmonic Balancer Kit is a quality product that would be right at home in the modern automotive workshop.